Hollywood is awash in quickie pizza joints that seem to do most of their business in the wee hours of Friday, Saturday and Sunday mornings. Move over pizza, now there's something meatier. Since it opened in June, Juicy Burger has drawn a steady stream of positive reviews and was even voted Best Burger in LA 2010 by Citysearch. Best burger in Los Angeles? Let's not get carried away. Best late-night dining option in Hollywood? It's a contender. Best burger for the buck? Definitely. 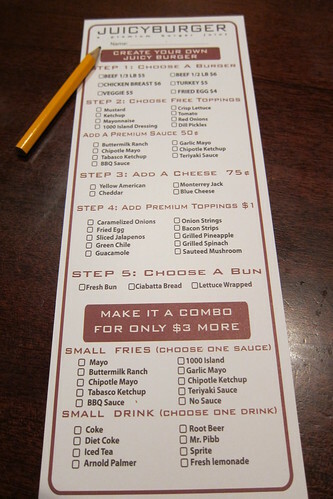 Juicy Burger offers a build-your-own-burger menu reminiscent of The Counter. Inspired by or ripped off from? You say tomato, I say toe-ma-toh. 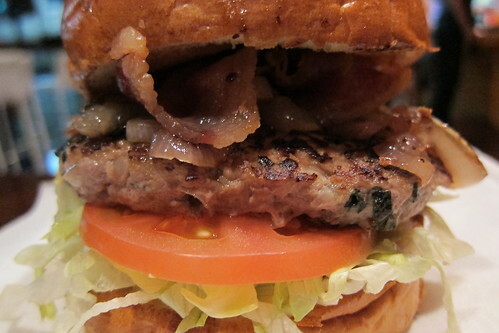 The meat here isn't as good as the stuff at The Counter, because despite their name, Juicy's burgers are a bit dry. Also, they seem to be cooked medium-well regardless of what you order. The burgers are, however, big. ($5 for a 1/3-lb. and $6 for a 1/2-lb.) The glistening brioche buns are soft and fresh, and they have integrity. They hold up to the burger from first bite to last. Juicy Burger's toppings are varied and generous. There's no charge for the basics: ketchup, mustard, mayo, lettuce, pickles, onions, etc. Among the fancy sauces ($.50 each), the chipotle ketchup is a hands-down winner. Cheese -- cheddar, American, Monterey jack or blue -- will cost you $.75. Then you get to the fancy toppings ($1 each): bacon, sautéed mushrooms, green chiles, grilled pineapple, a fried egg. You can make yourself a $12 burger, if you try, but you can just as easily walk out of their stuffed to the gills on a $6 cheeseburger at 2 a.m.
Or not. 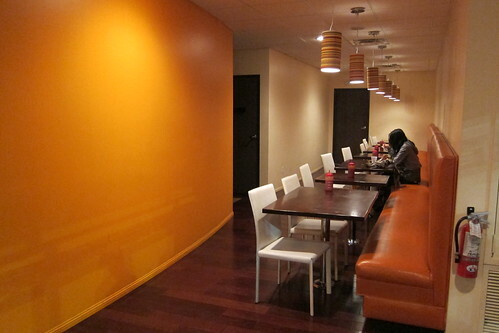 The interior, a long, narrow room with minimalist, dark wood tables and orange walls, is inviting enough to make you want to linger. 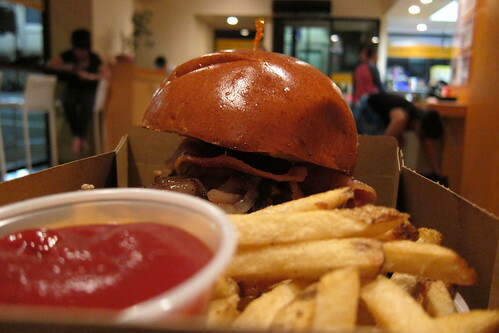 Unlike most of Hollywood's late-night pizza joints, there's nothing the least bit seedy about Juicy Burger. Depending on your state of mind circa a typical weekend at 2 a.m., that's either a huge advantage or a crushing disappointment.